1. How do you feel about Groundhog’s Day? I have no opinion of Groundhog’s Day. I don’t get caught up in what ole Phil is doing on February 2nd, to be honest. I live in Florida and we have had summer-like temperatures for most of the winter season. I wasn’t too concerned with his opinion of winter this year. 2. What color are your fingernails right now? No color. I never paint my fingernails. Anytime I apply nail polish myself, it looks so sloppy and makes me feel like my nails are suffocating. I like the natural look better. 3. Do you like riddles? They are fun to try and figure out, but I’m usually pretty bad at doing so! 4. When you were 10, how old did you think “old” was? At your current age, how old do you think “old” is? Hm…interesting question. For me, I think there was such a wide range, even starting with high schoolers! I think “old” to me was just maturity and independence, not so much an age. 5. Do you wish on stars? Yes! We recycle plastic bottles, aluminum cans, paper, and glass. Our apartment now has on-site recycling cans to make the process even easier. I think it’s irresponsible not to, unless your community makes it too difficult. 7. On a scale of 1-10, how good of a cook are you? I would say 7 or 8. I am not a bad cook. I just don’t like to cook. 8. Do you color your hair? Professionally or at home? I get my hair colored professionally. While I could do it for much cheaper at home, I can’t get the same results that I need from my salon. And I just like having someone else do it and know she’s not going to screw it up! Hehe. 9. On a scale of 1-10, how do you rate your manners? 10. Who are the last 5 people you have texted? Melissa, Amber, my mom, Kate, and my boss. Ten on Tuesday is a weekly series run by Chelsea of Roots and Rings. 1. Do you were glasses, contacts, or are you one of those perfect eyed people? I wear glasses currently. I want to switch to contacts when I go for my next eye appointment (in January) since glasses get in the way when I’m exercising or running but I think I look better with glasses than not, so I’ll probably always wear them for the majority of the time. 2. What is the next item you are going to purchase? Currently, my brother’s Christmas gift. I don’t think he reads my blog but I won’t mention what it is, just in case. It will be my first Christmas gift purchased and I can mark him off my list. Yay! 3. Have you ever watched Judge Judy or any other real court show? 4. How do you feel about fake nails? They’re not for me but almost every woman in my office has them. I just don’t feel the need for them, personally. Football. NFL football, especially. I could watch it all day, every day. 6. If you could create your own Ben & Jerry’s ice cream flavor, what would it be and what would it be named? Oh, gosh. I am so not original or creative enough to think of a good answer to this question! I do say that “Half-Baked” comes pretty close to perfection. 7. Do you have any scars? 8. Does your pet’s name fit them? Is there a more appropriate name? I think it does. I’m not sure I could come up with a better one, at least off the top of my head. 9. What is your favorite television show theme song? 10. What was your favorite activity on the playground? It’s a toss-up between the swings and the monkey bars. 1. What is your favorite month? November has always and will always be my favorite month. It’s the kick-off to the Christmas season and features my two favorite holidays: Thanksgiving and my birthday! Thanksgiving has always been one of my most favorite holidays, although it’s going to be a whole lot different this year. But I think the change will be a good one! 2. What is the best candy to get while trick or treating? Anything with chocolate! I was always a sucker for Three Musketeers when I was little. 3. What kind of pen do you use? I don’t have a specified type or brand I have to use. I don’t like gel-ink pens at all, though. I’m really simple when it comes to my pen needs. Give me a plain, ole ballpoint pen and I’m happy. 4. You go to a new Italian restaurant, what is your go-to order? It depends if I was trying to be healthy or not. Let’s go with not, in which case I would order chicken parmesan. That’s my favorite thing to order from an Italian restaurant and surprisingly, Olive Garden has the best-tasting chicken parm, in my opinion. 5. If you could choose to have any celebrity’s hair, who’s would you choose? Kate Walsh. I just love her hair. It’s so gorgeous and the color is fantastic. I want her hair. 6. What’s your favorite board game? Trivial Pursuit. My mom and brother hate it but I almost always pick it when it’s my turn to pick. I’m also pretty darn good at it, if I do say so myself! 7. Do you know how to play poker? 8. What do you think about Old Navy commercials? I think they are so cheesy and poorly done. I really can’t stand them. 9. What hurts worse- a stubbed toe or a paper cut? For me, a stubbed toe because ever since I’ve started getting pedicures, my big toe will hurt like a mother if I stub it. The nail ladies go to town on my cuticles and the area is so tender for weeks afterwards. 10. What’s your favorite kind of pie? None. I’m not a fan of pie. In fact, I could never eat another slice of pie for the rest of my life and I would be just fine. The same could be said of ice cream. I’m not sure why, but pie and ice cream don’t tempt me in the least and I almost never have cravings for either. 1. What is the worst compliment you have ever received? I get comments a lot on how quiet I am or how young I look. Those can be good and bad. Sometimes, it’s hard to go places and people think you’re 15 or 16 when you’re actually well into your twenties. And whenever I get “complimented” on how quiet I am, it always feels like they say it like it’s a bad thing. For a long time, I felt like my quietness was a bad quality to myself but now I know it’s not. I love my quiet nature now, although I have my chatty/loud moments! 2. Did you/would you tell everyone the name of your baby before they were born, keep it a secret, or not choose until after they were born? I would probably tell close family, but I don’t think I would tell everyone. I tend to let others’ opinions affect me too much so I know if other people hated the name, it would cause me to wonder if it was the right one. Plus, all the “Oh, I used to know a so-and-so and he was a demon child…” remarks would get on my nerves. 3. What is your favorite candle smell? Anything but vanilla or the super sweet smells that Bath & Body Works is selling now for the holidays. 4. What is the best birthday/Christmas gift you received when you were pregnant or the best birthday/Christmas gift you gave a pregnant person that was really appreciated? I have no idea. I’ve never been pregnant nor have I gifted too many pregnant women. The only one that comes to mind is my sister-in-law, which I’m sure were appreciated, but none of the gifts really stand out for me. I think the teacher who impacted me the most was my fifth-grade teacher, Mrs. Chapman. She had a fun, laid-back personality but she also knew how to lay down the law. I learned so much from her and she made the year so fun. She’s the reason I wanted to go into teaching (even though that career path didn’t seem to work out…). 6. What is the best game/activity you have ever played at a baby shower? The only baby showers I remember going to are my aunt’s when my cousin was born (I was younger than 10) and my SIL’s for my nephew. At my SIL’s, we played a game where everyone was given a pacifier on a necklace when they entered and anytime you saw someone crossing their arms, you could take their pacifier necklace (and any more they had collected). I had an entire competition with another girl who was there, but she won, in the end. Sigh. Such a fun game, though! 7. What was your major in college and did you end up using it in your career? Journalism and Media Studies, although my diploma says “Communications”. I do not plan on using my journalism degree in any form, although I do use the communications/media part of my degree to some extent. 8. What is a beauty product you swear by? I love Cetaphil for facial cleaner/moisturizer. I used to use it twice a day religiously and made my skin clear up and feel so much better, but I got away from that. And I also use BareEscentuals for my make-up, which I love. It covers nicely and I barely even remember I’m wearing make-up when I have it on. 9. What is the kindest thing a stranger has ever done for you? Holding a door open for me. It’s a simple thing, isn’t it? Common courtesy? But so many people don’t do this and it drives me nuts. When they do (especially if I’m farther away than needed to keep the door open), it brightens up my day! 10. If you could recommend one new baby necessity, what would it be? I’m not a mom, but one of my favorite local radio DJ’s just became one and she called in to the show one morning and said the best gift she got was someone to clean her house. She left with her baby and when she came back, her house was sparkly clean! So, I’m guessing that! Hehe. 1. 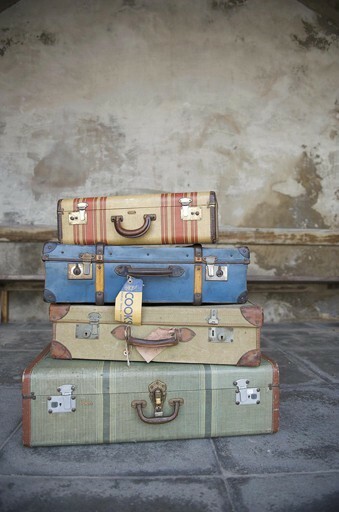 You’re packing for a week long vacation, do you pack ahead of time or wait until the last possible minute to pack? Usually, I get really excited so I make a big packing list a week before. But it’s always too early to pack for anything so I wait until usually the night before. I didn’t pack anything for my cruise until 10:00 the night before I left, even though I made list after list a month before. 2. Are you a light or heavy packer? Heavy, heavy, heavy. I packed so many clothes for my cruise that I didn’t even touch and always tend to overpack even when I go to Orlando. But I’d much rather pack too much than pack too little. 3. What are your favorite road trip snacks? I don’t go on enough long road trips to require snacks but if I did, I’m sure they would be the perfect mixture of sweet and salty: M&M’s, chips, pretzels, Twizzlers, etc. 4. Do you take any reading material along? Always. Of course, I almost always have my Kindle with me anyway. You never know when you’ll get stuck somewhere! Reading material is always a must. 5. Do you prefer to drive or fly to your vacation destination? I never fly to my vacation destinations, sadly. I want to, but I’ve never had the opportunity. I’ve actually never been on a plane in my life. I need to remedy that SOON! 6. What is your favorite time of year to take your vacation? Any time! I love taking vacations but I don’t have a specific time of year that’s my favorite. It’s nice to do something around my birthday, but also nice to go away in the Spring/Summer to break up the monotony. On a cruise ship. I swear, if you haven’t been on one, YOU NEED TO GO. I find them fairly reasonable (price-wise) for everything you get. And they are just absolutely amazing. I am SO excited to take my second one next May. Being on the cruise ship last May was the best experience of my life. 8. You are vacationing in the mountains, what is your favorite thing to do while there? I’ve only vacationed once in the mountains and I was twelve, but it was so much fun. My favorite thing would be skiing, of course! I only skiied on the bunny slopes but it was so fun. I really want to go again sometime, even if I stayed on the bunny slopes again. 9. You are at the beach for your vacation, do you like to take it easy on the beach or play all day in the water? I am definitely more of a fan of taking it easy. I hate salt water and being in the ocean. It’s either freezing or I’m constantly getting thrown over by waves. I don’t like it. 10. While you’re on vacation, do you prefer to eat out every night or cook some of your own meals? No way am I cooking while on vacation! I don’t understand people who do this. But that’s probably because I hate cooking even when at home. I have never cooked my own meal while on vacation, but I’ve also never vacationed for more than five days. I’m not sure I would eat out every night if I was doing it longer than a week, because that would get expensive! 1. What is your favorite brand of shoes? I don’t really have one. Usually, I hit up Target or Famous Footwear when I want to buy new shoes. (And it is only recently that I’ve been interested in more than just flats and flip-flops!) I’m still not very brand-conscious when it comes to buying shoes. Just whatever looks pretty! 2. How old were you when you learned to tie your shoes? I don’t think I learned until kindergarten, because I distinctly remember my father yelling at me while he took me to school when I was in kindergarten about not knowing how to tie my shoes. I’m guessing I learned quickly after that. 3. How do you feel about freckles? I love freckles! I don’t have any of my own, but I’ve always wanted some. I’m also really very jealous of the smattering of freckles across my mom’s and brother’s shoulders. I want shoulder freckles of my own! 4. I can count to ten in ___ languages. Three. English, Spanish, and Japanese. And if you count Pig Latin as a language, then four. 5. What is your favorite store-bought ice cream flavor? 6. Were you in ballet or gymnastics as a girl? No, but I desperately, desperately wanted to be in gymnastics. After watching the 1996 Olympics, I was convinced I would be in the 2000 Olympics, not concerned with the fact I was already 8 years old and could barely do a straight cartwheel. (I did not perform in the Olympics, in case you’re wondering and I know you are.) I did t-ball and cheerleading, instead. 7. Who is your favorite Sesame Street character? Elmo, since he’s my nephew’s favorite. Also, Elmo is just so cool and adorable and talks in third person. What’s not to love? Ideally, 10:00pm but I usually don’t get to bed until 10:30 or 11:00. 9. Do you have any jewelry that you wear every single day? No. I rarely ever wear jewelry. 10. Who is the bug killer in your household? Whomever finds the bug first! I’ve killed my fair share of cockroaches, spiders, and flies, as has my mom. Who knows how to count to ten in another language? Teach me! I am literally so excited for this round of Ten on Tuesday questions. They come at the perfect time for me! Hosted by the awesome Chelsea, as always. I work in the media department of an advertising agency. I’m an assistant right now, learning the ropes. We promote giveaways for charities. I started my job on Wednesday so I’m brand-spankin’-new and in the honeymoon phase right now. I love my desk. I love my co-workers. I love my bosses. I love my new schedule. I love the work. I love the spreadsheets. I love the organizing. I love going the bathroom whenever I want. I love wearing cute outfits to work. I love the atmosphere and environment. Oh! I just love this job! 3. What’s your least favorite thing about your job? The newness. There is so much I want to do already but I have so much to learn before I do that. The good news is that they don’t expect you to jump in on your first day and know how to do everything. They know it’s a process and my boss has been very good at training me and making sure I’m kept in the loop. I cannot wait for the day when everything becomes common knowledge, but I’m patient to wait and be trained the right way first. 4. If you weren’t a _____, what would you be? I would probably still be working at the daycare. I’m shuddering right now. 5. What is something you would love to get paid for that you think no one would ever pay you for? Sleeping. I wish I could get paid to get 10 hours of sleep a night. How awesome would that be? 6. If you could have any job for exactly one day, what would it be? I think everyone needs to do a job in retail or customer service for one day. I worked at a movie theater one summer and it’s amazing how customers act. I genuinely loved serving our customers but I think many consumers don’t understand what it’s like for the workers. They’re just rude and usually, it’s not the fault of the staff. I would also love to be Kelly Ripa for one day. But on a day when she’s co-hosting with Anderson Cooper. Regis gets on my nerves. 7. If you had to do manual labor, what would you do? 8. What is something you were forced to learn in high school that was supposed to be super important, but you never actually use? Geometry? I don’t know if it was ever labeled as super important but honestly, I think it’s all important in some aspect. You need English and grammar skills. You need to know your history because you just look like ignorant if you don’t. You need to know math, because many jobs use it and it gives you a lot of good problem-solving skills. Et cetera, et cetera. It’s all important in a way. 9. Who was your favorite boss? Why? I guess I can’t choose my current one, since she’s only been my boss for four days. Hehe. I have to say that my former one, at the daycare, was pretty spectacular. She was tough on me, but also so supportive of everything I was going through, especially my schooling. 10. Where would you rather work: Dunder Mifflin Paper Company (The Office), Wernham Hogg Paper Company (The Office – UK), or Initech (Office Space)? I’ve never seen the UK version of The Office or Office Space (don’t shoot!). But I have seen many, many episodes of The Office and I would love to work for them. But only when Pam was the secretary and Michael was the boss. The new secretary (still don’t know her name) annoys me and an office without Michael Scott? How does that even work? Ten on Tuesday – Mac or PC? 2. What drew you to that operating system? The price, to be honest. My old Toshiba laptop had died a few months earlier and I was saving up to buy the cheapest laptop I could that would also work well for all my school projects and Internet things I would be doing. My old Toshiba had lasted 5 years while I had gotten an HP laptop in 2006 that died within 2 years so I definitely wanted to stick with a Toshiba. This one was about $450 total which was within my budget. It’s been a good computer, but I’m just ready for a change. 3. Mice – wireless or wired? Mousepad or none? I don’t use a mouse, just the trackpad that’s on my laptop. Since I rarely use my computer on a level surface, there’s really no point. But to answer the question, wireless and with a mousepad. Using one without just feels funny! 4. Other than the Internet – what do you use your computer most for? To write blogs that will go on the Internet? Honestly, take away the Internet, and there’s not much I do on this thing! Hehe. I should be doing more writing but I never seem to get around to it. I would really like to be better at HTML/CSS. I know the basics of it, but not enough to do anything with it. I can tweak blog designs, but nothing more than that. 6. Describe the first time you ever used a computer. I believe it was this big, clunky computer we got from a friend. I wrote a story on it, my first ever!, about a kindergarten class. It was pretty awful and boring. I also played Where In the World is Carmen Sandiego? That game was super fun. 7. How often do you upgrade to a new operating system? Every few years when I get a new computer. I wish I had Windows 7 on this computer. My mom has it on hers and it’s really awesome. 8. Are you a shortcutter (CTRL + C) or a right-clicker? Usually, I right click. It’s something I’ve become so used to, and it drives me crazy that you can’t do that in Google Docs. I almost always highlight the entire selection I want to copy, right click, forget I can’t use that option, and have to rehighlight the whole selection to do CTRL + C. It’s really very annoying. 9. Is computer use a constant thing in your life (such as using it at both work and home) or do you get a break (because you don’t use them at work)? At my old job, it wasn’t a constant thing but it will be at my new job. In a way, this excites me because I like being connected but in a way, it makes me fear what my home life will resemble since I’ll be using it so much at work. I don’t know if I’ll still be as connected at home or will want a break from it. Time will tell! 10. Where do you think the world would be if personal computers did not exist? I think we would have found something else to occupy our time with. I have no idea what it would be but we have been constantly evolving with the way we live from the beginning of time so I’m pretty sure there would be something else to make our lives easier, if not for the personal computer. Ten on Tuesday is run by Chelsea of Roots and Rings. Questions from Kara of Chatter. 1. What’s the perfect meal? If you don’t yet know about my obsession with Publix subs, then we are not as good of friends as I thought we were. I have them at least twice a week and challenge you to find a sub that’s more yummy and filling than this one. Subway has nothing on Publix. Sadly, they only have locations in the Southeast with Florida being the state with the most locations. Anyway, I still haven’t answered the question. Perfect meal: a Publix sub with an ice-cold Coke. Yum, yum, yum. I have this once a week as my “cheat meal”. 2. What are the perfect pair of shoes? Anything that I can comfortably walk in for a long period of time. My foot has a high arch so sandals and flats usually make the arch hurt (it literally feels like the skin on my arch is stretched to the max and any heel-to-toe foot strike makes my arch sting and feel like the skin will rip apart. You’re welcome.) so I’ll have to be lame and say running shoes. They offer the perfect support, although there are certain flip-flops I can wear that don’t hurt my foot as bad. 3. What is the perfect afternoon? Napping, especially if it’s a weekday. I’m usually busy applying for jobs, blogging, and cleaning during the afternoon so my afternoon naps have decreased over the past month. But it is a pleasurable way to spend an afternoon, I must say. Now, if it’s the weekend, the perfect afternoon is usually spent at a water park. I have passes to 3 different water parks in Orlando and I’m looking to use them to their full extent this summer! Water parks are the perfect way to spend an afternoon in Florida, because it’s just too hot and humid to do anything else! 4. What’s the perfect house? I’m not exactly sure. Somewhere that feels like home, that has comfy furniture and homey accents. Somewhere where I’m not afraid to kick my shoes off and curl up on the couch. 5. What is the perfect outfit? Something comfortable. Are we sensing a pattern here? Yoga pants, shirts that don’t cling to me, tank tops. 6. What’s the perfect wedding song? My friend Anisah’s first song with her husband was “At Last” by Etta James and to this day, I cannot think of a better first dance song. It’s poignant, slow, and romantic. 7. What is the perfect job? Right now, any place that will hire me! Ideally, something in communications where I can combine my passions for writing and marketing into one pretty sweet job. 8. What is the perfect hairstyle? I really don’t know. I love my hair short, but keep daydreaming about growing it long. But really? A ponytail. That is the perfect hairstyle. It’s off my neck and out of my way so I don’t have to bother with it. 9. What’s the perfect music festival? I love Christian music festivals, I really do. I’ve been to 2 or 3 and they are my absolute favorite. Being surrounded by people with likeminded views and singing praises to God is amazing. I feel at peace and completely whole. 10. What’s the perfect day to yourself? The last part of that question is the key: to yourself. Having a day to yourself is awesome enough! I would sleep in, read, go to the gym, read, catch up on blogging, read… Do absolutely nothing that required work I didn’t want to do. Ten on Tuesday is run by Chelsea of Roots and Rings. Find the questions here.